Bring a pan of salted water to boil. Add the sliced zucchini, cover and cook them for about 10 minutes. Drain and keep aside. Heat oil in a frying pan, add the onion and scallions and saute until translucent. Add the garlic,saute for 1 minute and take the pan off the heat. Squeeze the zucchini with your hands to extract all the water and place them in bowl. Add the fried onion and garlic mixture, bread crumbs, eggs, cheese, oregano, salt, pepper and mix well until all the ingredients are combined evenly. Take about a heaped tbs of the mixture, roll it into a round ball and press it gently to make the rissole shape. Make more rissoles in the same way. Coat the rissoles lightly in the flour and dust off any excess. Heat the remaining oil in a frying pan and fry the rissoles until they are crisp and brown, turning them over once during cooking. Drain the rissoles and serve warm with lemon wedges. WOW!! these defenitely are a treat!! This sounds really good ... Great idea! These look so good! I wish I had a plate in front of me right now! 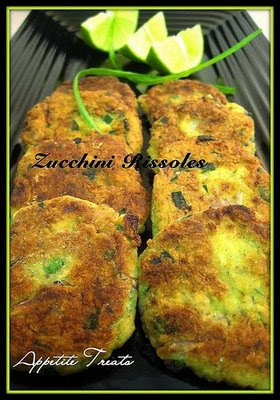 Zucchini rissoles wow sounds yummy and looks gr8. First time here, u have a nice blog. Hi I have put my award in my blog:) thanks to u.